Our 2003 event was a lot of fun. Here's some first round winners and lots of other folks having fun. in the Trans Am nationals car show. Next yeat the rule will change to include - "Most rounds won." Peter Mijatovic won the BIG ONE! He red lit to our own Andy in the final of P3. up early enough on Saturday to make the drags. This year he did and look what he's showing his friends now! Last year it was Dustin Hollingsworth. Brian Palcisko had the baddest T/A there. (Gold car.) 9.40's in time trials. He had trouble in the first round. Car wouldn't move. He was way late and David Berry took the win. Ron Ball in the blue '79 had a tighter package than Mike Malnak in the '01 T/A. Ron didn't show up for the All-Tech-Card drawing and missed out on the dial bore gauge set. Oh man. However he did go to the final round. Yeah! Bill Reimec red lit on his 13.45 dial. Dan Patterson red lit right behind Bill. He had a 11.44 dial and ran a 11.37. Rather be lucky than good? It worked for Bill! Don Calloway in the white '98 dialed 14.02 and went 14.21 for the win. The other guy in #P124 needs to have his girlfiend fill out his tech card next year. I can't read his name at all! 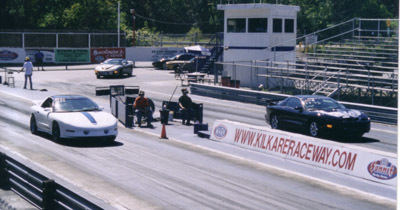 Mike Brown in the '99 LS1 laid a .520 reaction time on Hollie McManus who was no slouch with a .580. Mike ran closer to his dial for the win. Ed Robbins in the red '68 and Marc Petrosky in the blue '68. Both 455 powered. Ed =.571 light. Marc a .578. Ed 10.30 on a 10.23. Marc 13.02 on a 12.80. 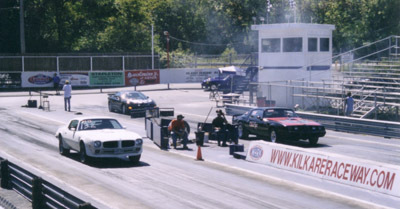 James Sanders in the black '85 'bird had a .532 light and and ran a 11.78 on a 11.75 dial. Phil Boylan was laaaaaaaaaaaaaaaaaaaaaaaaaaaaaaaaaate. Went 12.53 on a 12.60. But Phil did good in the popular after race drawing. 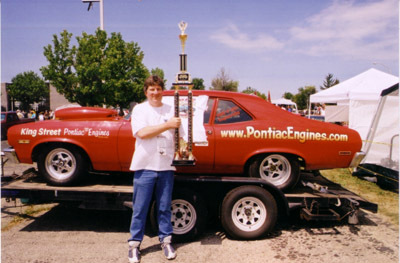 He won the '65 GTO Jolly Green Giant die-cast model. Mark Billings ('70 bird) peeled of a .551 R/T and only needed to run a 13.13 on a 12.70 dial. Shane Miles was distracted by the dancer in the grandstands. He was laaaaaate also. 2002 T/A CE of Steve Turley is one bad bird. 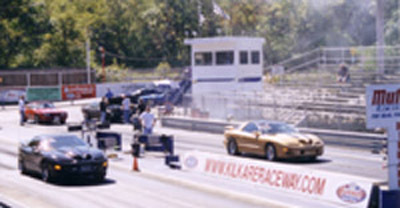 Steve dialed a 10.40, had the better R/T, but went too fast with a 10.26 at 125.31 mph. Tim Gorden got the gift when he cut a .835 light and also went faster than his dial, 15.52 on a 15.65, Steve broke out by more. Brian Nicodemus put up better in his '94 than Larry Jones in his '70 Formula. A .589 to a .624 light, and a 13.93 on a 13.80 dial. Larry ran a 14.00 on a 13.75 dial. Jeff Horn red lit against the '89 'bird of Brett Harmon. Brett would have been tough to beat as he had a better R/T and ran a 14.52 on a 14.50 dial. The black '98 belongs to Jeff Sapper. He reeled off a .543 R/T and ran a 11.26 on a 11.20 dial. Joshua Miller ran a 13.85 on a 13.81 dial - but had a slower R/T than Jeff. That's all of the P-1 pics we have of round one.